The South is a friendly place, as all of us know, but Philadelphia may be at the top of the friendly list. You’ll find friendly faces in every shop, smiles from people you pass on the street, and almost everyone you meet will find time to say hello and pass the time of day. This is a small town worth a long look. It’s an old town, founded in 1903, and at its center is the city square where the stately county courthouse can be found. It’s surrounded by small business of many sorts, all locally owned, and it’s hard to find a franchise or chain store around. This is Americana at its very best. Williams Brothers is a Philadelphia icon. The store has been around since 1907. The railroad came through Philadelphia in 1905, and the city grew into a prosperous small town and today still boasts not less than 8,000 people. Of course, long before this city was founded, the area was the very heart of the Choctaw Nation. That proud tribe, now known as the Mississippi Band of Choctaw Indians, prospers, and their Pearl River Resort is an unparalleled economic engine that draws tourists from all over the Southeast. But who can think of Philadelphia and not think of the world-renowned Neshoba County Fair? This grand event takes place the last week of July and has got to be the quint-essential old-time county fair. It is known as “Mississippi’s giant house party,” and with families that have attended for generations, the nickname is perfect. People flock to see the horse races, political speeches, carnival midway, and some of the best entertainers the South has produced. Its roots are, of course, in the agricultural fair that was once the highlight of almost every county’s summer time calendar, but this fair has grown and is now the granddaddy of them all. But there’s much more to see and do in Philadelphia. The fair may be a grand time for all, but this city has much to offer in every season and for all tastes. The diversity of shops will surprise most who visit here, and a stop at Kademi is a great place to start. This smart shop features original designs in baby clothing, bridal gifts, accessories, and candles. It is best known for its original shirt designs, created by Kim Mills and Dawn Lea Chalmers, talented owners and best friends. Next you might want to stop by Steve’s on the Square, which opened in 1983 and offers trendy clothing for men and women. You’ll find classic brands here like North Face, Patagonia, and Ralph Lauren. This small business is serious about friendly service, and owner Steve Wilkerson says, “We’re not selling clothing, we selling ourselves.” Magnolias and Sassafras is the sort of shop you wish you’d find in every town in the state! It sells only Mississippi-made or Mississippi-designed products, and you will be pleasantly surprised at the wide assortment of gifts from pottery to handmade soap and birdhouses. They have also just added a coffee shop and sweet shop, so this just might become your favorite place to stop on the square for refreshments. Faulkenbery’s is a bridal and gift shop, and owner Amy Willis says “We’re your one-stop bridal shop, and we have everything you need for that special day.” Faye’s Clothing and Antiques is as unique a shop as you will find and offers a huge assortment of second-time-around clothing, jewelry, and antique furniture. It is located in the old JC Penney building and presents a great opportunity to shop and talk to owner Faye Luke and her staff in a relaxed and friendly setting. If you’re looking for something upscale, stop in at Dees. There’s been a department store or shop of some sort on this spot since 1956, and owner/buyer Susan Dees Rosamond’s grandfather had a grocery store here for years. This ladies shop that takes fashion seriously but is as friendly a place as you’ll ever find. In fact, there’s no posted closing time, as Susan will stay open for her customers, best friends, and family as long as need be. If you’re done shopping and want to have a look around town, stop in at Ye Ole Drug Store Deli and Restaurant for a special treat. George Yates will be glad to show you around and tell you a tale or two as well. This is an old-time shop built in 1905, and still has the original display cases and soda fountain. The Yates family has owned the business since 1906, and in 1923 they opened a hospital on the second floor. The hospital closed in the 1950s, but many of the furnishings are still there. There is also a handful of historical markers in Philadelphia that history buffs will find interesting. Country music star Marty Stuart and bluesman Otis Rush both hail from Philadelphia. In 1863, the Union cavalry raided the town during the Vicksburg campaign in the War Between the States in a move now known as Gri-erson’s Raid. There is also a marker identifying the Philadelphia jail as a civil rights site. The Philadelphia-Neshoba County Historical Museum is worth a long look with information on the county’s beginnings and famous residents. 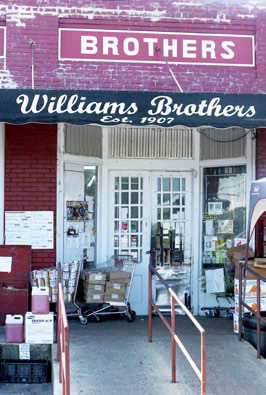 But the spot you don’t want to miss is Williams Brothers general store. This is an old-time country store that opened in 1907, and today it is still packed with everything from lo-cal produce, mule collars, and boots and shoes for everyone to overalls, the best smoked bacon and hoop cheese, cast-iron skillets, and just about any-thing else you could think of. This place is so fascinating that National Geographic magazine featured it in a 1937 edition, and it has become even more interesting today. The Mississippi Band of Choctaw Indians Museum is also worth your time, presenting a fascinating look at America’s original inhabitants. As you will find in most small towns in the South, there’s a church for every denomination, but the Holy Rosary Catholic Church is exceptionally beautiful. The county fair is not the only event that keeps Philadelphia on the sum-mertime map. Just before the county fair kicks off, the Choctaw Indian Fair gets going, and this fair recently celebrated its 64th year this summer. The event features four days of unique events found nowhere else in the state and includes the Choctaw Indian Princes Pageant, the World Series of Stickball, and world-class entertainment. The Ham Jam Arts Festival is held in April and celebrates food, fun, and barbecue. For those who prefer to have a good time in cooler weather, there’s the OctoberFest where you will find arts and crafts, food, music, and children’s games. If it’s peace and quiet you’re looking for, then take a walk in one of the city’s parks, or go fishing at Lake Pushmataha or Neshoba County Lake. Mississippi is known as the home of the blues, and if you are in the mood, check out 424 Blues Café. This place was inspired by Philadel-phia native Otis Rush, who is known as the left-handed upside down guitar player, and when the café cranks up, you’re sure to have a good time. Mississippi is fast becoming known as a culinary destination, and Philadelphia’s restaurant scene is vi-brant and diverse. Don’t miss Peggy’s for some of the best Southern-style food around. Everyday there is a different offering, but make sure to come by on Friday for the fried chicken. When you’re finished, you won’t find a cashier waiting for you, but only a jar by the front door to drop your payment in. This is the art of Southern food at its best. Amy’s Place is just down the street and offers takeout and catering. Owner Amy Van Devender offers Southern food that is upscale and a bit lighter. “I offer a little bit of every-thing,” says Van Devender, but special attention should be given to the chicken pies, tropical chicken salad, and the spicy pimento and cheese. Ronnie’s Steak N Grill is the right choice for those looking for a charcoal-grilled steak that’s hand cut to order. Owner and grill master Ronnie Anderson has been in the restaurant business for years and may very well be the friend-liest man in town. Also make sure to check out his lunchtime buffet and salad bar. Old Mexico has been around for years, and owner Jose Euyoque is a pro at making south-of-the-border specialties and has a huge following in town. City Limits is known for its steaks, seafood, and friendly service, and Firehouse Bar-B-Que is the place for great barbecue and Southern sides so good many patrons some buy extra to take some home. There’s no mistaking Philadelphia for anything other than a friendly Southern town with a lot to offer any time of the year. It’s centrally located in the rolling green hill country and is an easy jaunt from I-55 or I-20. When you visit, be prepared to meet friendly people and smiling faces.